As Easter approaches, we tend to focus our reflections on the life, death, and glorious resurrection of Christ. 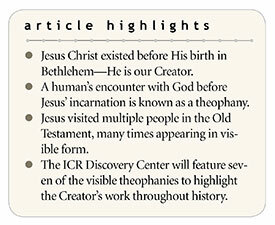 We even mark the timeline of history by whether events happened before (BC) or after (AD) Christ’s birth. But Christ’s existence didn’t begin with His time on Earth. The apostle John emphasizes this when he begins his gospel account. The apostle Paul also affirms this truth in the book of Colossians. The Lord Jesus Christ was present at the beginning of creation—He was and is our Creator. His pre-existence is further affirmed by His many appearances documented throughout the Old Testament. Theophany is a theological term that refers to an encounter with God prior to Christ’s incarnation. There are over 50 possible theophanies recorded throughout the Old Testament, primarily concentrated in Genesis, in the Exodus and conquest events, in Judges, and in the prophets. Jesus Christ existed before His birth in Bethlehem—He is our Creator. Visible manifestations most often involve the Angel of the Lord appearing in human form, but could also include other visible encounters such as the fire and smoke on Mount Sinai. Auditory manifestations are indicated by the many “and the LORD said unto...” statements found throughout the Old Testament, but also include unique encounters like the “still small voice” that spoke to Elijah in the cave (1 Kings 19:12). Visions and dreams also exhibit theophany characteristics, such as Jacob’s ladder dream (Genesis 28:12), Daniel’s man in linen vision (Daniel 10–12), and Zechariah’s man among the myrtle trees vision (Zechariah 1:7-17). However, whether or not visions and dreams should be considered theophanies is controversial among scholars since they involve a metaphysical or spiritual presence rather than a physical one. John 1:18 tells us that “no one has seen God at any time.” Does this contradict the many visible manifestations mentioned throughout the Old Testament? Not at all, for John also explains in the same verse that “the only begotten Son, who is in the bosom of the Father, He has declared Him.” In other words, whenever the omnipresent, invisible God has chosen to appear to people, He has done so in the person of His Son, Jesus Christ. In this passage, it says that “the LORD appeared to [Abraham] by the terebinth trees.” Note Abraham’s immediate reaction. He looked and saw three men standing near him. He “ran…to meet them, and bowed himself to the ground” (vv. 1-2). It seems plausible that Abraham may have recognized the pre-incarnate Lord Jesus Christ from previous encounters in Genesis 12:7 and 14:18-20. Only one of these men—the Lord Jesus—spoke with authority. Not only does He prophesy that Sarah will have a son in her old age (v. 10) but He knows that Sarah privately laughed in her tent when she overheard the news. He responds by asking, “Why did Sarah laugh?…Is anything too hard for the LORD?” (vv. 13-14). Jacob spent the night alone as he was waiting to meet his estranged brother, Esau. The passage says “a Man wrestled with him until the breaking of day” (v. 24). When Jacob continued fighting after long hours of struggle, the Man touched the socket of Jacob’s hip and instantly maimed him (v. 25). Still, Jacob refused to release Him, even while experiencing excruciating pain. Jacob cried out, “I will not let You go unless You bless me!” (v. 26). The Man said, “Your name shall no longer be called Jacob, but Israel; for you have struggled with God and with men, and have prevailed” (v. 28). And Jacob, recognizing the divinity of Christ, the Man with whom he wrestled, responded with a bold proclamation: “For I have seen God face to face, and my life is preserved” (v. 30). 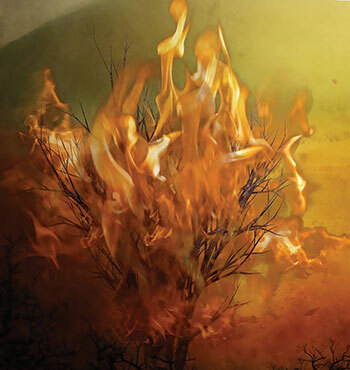 Moses, a fugitive from Egypt, was tending to his father-in-law’s flock when the “Angel of the LORD appeared to him in a flame of fire from the midst of a bush….The bush was burning with fire, but the bush was not consumed” (v. 2). God called to Moses from the bush, telling him, “Do not draw near this place. Take your sandals off your feet, for the place where you stand is holy ground” (v. 5). 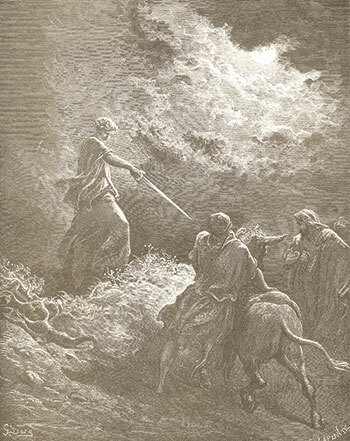 We know this was no ordinary angel because He clearly revealed His identity to Moses: “I am the God of your father—the God of Abraham, the God of Isaac, and the God of Jacob.” The passage tells us that Moses “was afraid to look upon God” as the Lord called him to lead the Israelites out of Egypt (vv. 6-10). Many artistic interpretations of this event depict the flaming bush that did not burn, but the text clearly states that the Angel of the Lord was visible to Moses. It is possible that the shekinah glory of God emanating from the Angel—the pre-incarnate Christ—standing in the midst of the bush gave the appearance of fire. When Balaam saddled his donkey and headed to Moab with instructions from King Balak to curse Israel, the Bible tells us that the “Angel of the LORD took His stand in the way as an adversary against him” (v. 22). Balaam’s donkey did everything she could to avoid crossing paths with the Lord Jesus Christ, who planned to kill Balaam as he passed by. The donkey crossed over into a field, pushed herself against a wall, and even lay down in the middle of the road. Balaam, unaware of the Lord’s presence, struck the donkey for her disobedience to his commands. Then, “the LORD opened the mouth of the donkey, and she said to Balaam, ‘What have I done to you, that you have struck me these three times?...Am I not your donkey on which you have ridden, ever since I became yours, to this day? Was I ever disposed to do this to you?’” (vv. 28-30).1 Animals’ mouths, tongue muscles, and brains are not designed for human speech, so supernatural intervention was absolutely necessary for this to happen. “The LORD opened Balaam’s eyes, and he saw the Angel of the LORD standing in the way with His drawn sword in His hand; and he bowed his head and fell flat on his face” (v. 31). God has the power to use whatever means necessary to accomplish His will. In this case, the Lord used a wicked and perverse false-prophet-for-hire (v. 32) to bless and protect His chosen people. After the Israelites were delivered out of Egypt and had wandered in the wilderness for 40 years, God charged Joshua to lead the next generation to conquer Canaan. When Joshua was near Jericho, he “lifted his eyes and looked, and behold, a Man stood opposite him with His sword drawn in His hand.” Joshua approached the Man and asked, “Are You for us or for our adversaries?” (v. 13). “So [the Man] said, ‘No, but as Commander of the army of the LORD I have now come.’ And Joshua fell on his face to the earth and worshiped” (v. 14). The Man, the Lord Jesus Christ, let Joshua know exactly who was and is in charge. “Then the Commander of the LORD’s army said to Joshua, ‘Take your sandal off your foot, for the place where you stand is holy.’ And Joshua did so” (v. 15). Joshua’s encounter with Christ encouraged him to begin the conquest of Canaan and fulfill God’s promise to Abraham (Genesis 12:7). The Lord Jesus Christ appeared again in the time of the Judges during a 40-year period when Israel was oppressed by the Philistines. 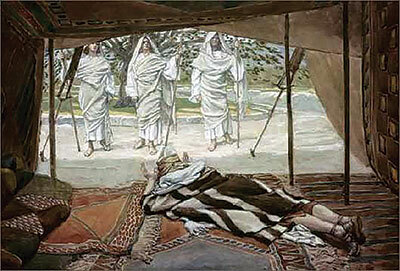 He visited an unnamed woman who had been unable to bear children for many years: “Indeed now, you are barren and have borne no children, but you shall conceive and bear a son….and no razor shall come upon his head, for the child shall be a Nazirite to God from the womb; and he shall begin to deliver Israel out of the hand of the Philistines” (vv. 3-5). This prophecy foretold the life of Samson. When the woman told her husband, Manoah, about the encounter, Manoah prayed that the “Man of God” would come again and teach them what to do (v. 8). The Lord Jesus visited and spoke with both of them. Manoah offered to feed his guest. “The Angel of the LORD said to Manoah, ‘Though you detain Me, I will not eat your food. But if you offer a burnt offering, you must offer it to the LORD.’ (For Manoah did not know He was the Angel of the LORD)” (v. 16). “So Manoah took the young goat with the grain offering, and offered it upon the rock to the LORD. And He did a wondrous thing while Manoah and his wife looked on—it happened as the flame went up toward heaven from the altar—the Angel of the LORD ascended in the flame of the altar!” (vv. 19-20). 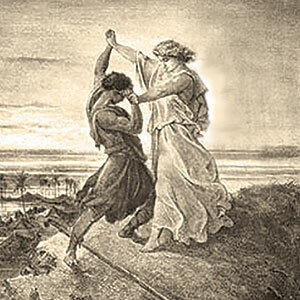 Manoah and his wife fell on their faces to the ground. “When the Angel of the LORD appeared no more to Manoah and his wife, then Manoah knew that He was the Angel of the LORD. And Manoah said to his wife, ‘We shall surely die, because we have seen God!’” (vv. 21-22). But she contended that God would not have accepted their burnt offering or foretold Samson’s birth had He intended to kill them. “So the woman bore a son and called his name Samson; and the child grew, and the LORD blessed him” (v. 24). King Nebuchadnezzar commanded the people of Babylon to bow down to his idol at the trumpet’s sound. Shadrach, Meshach, and Abed-Nego, exiles from Israel, refused to worship anyone but the Lord. Their refusal angered the king, and he commanded they be thrown into a fiery furnace, a seemingly unlikely place for a glorious theophany. “Then King Nebuchadnezzar was astonished…‘Did we not cast three men bound into the midst of the fire?...Look!...I see four men loose, walking in the midst of the fire; and they are not hurt, and the form of the fourth is like the Son of God’” (vv. 24-25). The king called the men to come out of the fire and discovered that “the hair of their head was not singed nor were their garments affected, and the smell of fire was not on them” (v. 27). Scholars debate whether the fourth man in the fire was the pre-incarnate Christ or one of God’s mighty angels. Nebuchadnezzar described the man as one “like a son of the gods” [literal translation] and later calls him “His Angel.” But the dramatic imagery of this event, followed by praise for God by a pagan king, is undeniable. “Nebuchadnezzar spoke, saying, ‘Blessed be the God of Shadrach, Meshach, and Abed-Nego, who sent His Angel and delivered His servants who trusted in Him, and they have frustrated the king’s word, and yielded their bodies, that they should not serve nor worship any god except their own God’” (v. 28). When God enacts a miracle, He supernaturally controls all details so that His power is unmistakable, and there is no other explanation! The Creator has been at work in His creation throughout Earth’s history. In these seven theophanies, we see the Lord Jesus Christ visiting people during significant times in their lives, meeting their needs, revealing His character, and intervening in a personal way. These events will be featured in the ICR Discovery Center for Science and Earth History. The goal of this center is to glorify and reveal our Creator. So, after the main exhibits displaying the scientific evidence for God’s creation, visitors will be introduced to the Creator Himself. The scenes of the Old Testament theophanies will precede a dramatic hologram-based exhibit of the life of Christ, who revealed Himself as never before when He was born in the flesh and walked this earth for 33 years. His perfect, sinless life culminated in a horrific death on the cross. He paid the penalty for our sins, so that we could become children of God. Just as Christ’s existence didn’t begin with His earthly birth, neither did it end with His earthly death. 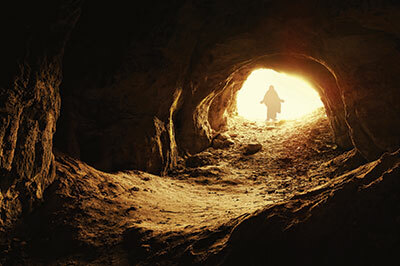 After three days, He rose from the grave, ascended to heaven, and sat down at the right hand of God, where He ever lives to intercede for us (Mark 16:19; Hebrews 1:3; 7:25). God’s presence now lives in each believer through the Holy Spirit. What a joy it is to know that the Holy Spirit of God is always with us (John 14:16-17; 16:7-14). The God who has appeared throughout all of history, whose work we see in creation, and whose sacrifice assured our salvation will appear again one day before our eyes. In that day, the whole world will respond in worship and praise to Him (Philippians 2:9-11). What a day that will be! In his study Bible notes, Dr. Henry Morris commented that Balaam’s apparent lack of surprise at hearing the donkey speak “was probably due both to his direct encounter with God the previous night (Numbers 22:20) and also his unthinking rage, accompanied by physical pain, caused by the stubbornness of the animal.” Morris, H. M. 2012. The Henry Morris Study Bible. Green Forest, AR: Master Books, 278. Portions of this article were adapted from Sunday school materials prepared by Henry M. Morris IV, ICR Director of Operations. Cite this article: Staff Writer. 2019. Theophanies in the Old Testament: The Creator at Work in His World. Acts & Facts. 48 (4).